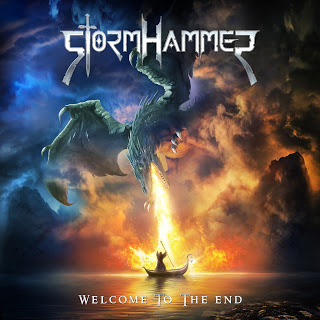 Continuing to carry on nicely, German power metallers Stormhammer have steadily built up their brand of power metal with the expanded use of live dates and constant work to get to the point where the band has improved with every release thus far. Keeping the same lineup from their last effort, the groups’ sixth full-length was released March 24, 2017 on Massacre Records. Offering up plenty of rather impressive work here, this is driven quite nicely by the bands’ rather fun and impressive driving, melodic attack. Featuring efforts like the title track, Northman and Secret that utilize a rather thick rhythm section, there’s a much heavier, more traditional-sounding structure built up here with a nice driving attack utilizing the more harder-hitting rhythms during the main sections here. That translates into a steady stream of heavy mid-tempo gallops for the most part here, letting the bands’ faster moments carry this one along to the point of enjoyment throughout here by going for the striking riff-work, the old-school sounding patterns and generous melodic rhythms that give this such a strong and enjoyable method of attack here that manages to hold this up one over the album’s one overbearing, glaring flaw that’s nearly impossible to overcome. Simply, there’s just way too many tracks here and it really wears on the longer this goes as it just features such an enlarged running time with over a dozen tracks here that there’s just no reason for the release to be this long, especially with so many of the songs here being pretty much of the same type and quality. Once you hear efforts like The Law and Watchmen sound basically like the same fiery, energetic crunch as the earlier tracks the need for going on this long makes less sense with no deviation or variation, so regardless of the quality of the tracks the fact that this one has this bloated, overlong feeling is hard to pass-up and ignore. Review: Arch Enemy – As The Stages Burn!